Yael Bartana, Inferno, 2013, HD video, color, sound, 18 minutes. Panning over a seductive canopy of tropical trees toward a dense metropolis, a sound track of helicopters provides a seismic calibration for the coming narrative. Focusing first on the gathering of a joyful crowd of intergenerational, multiracial celebrants at an altar, a tone of reverence descends, which before long is ruptured by an apocalyptic rapture. 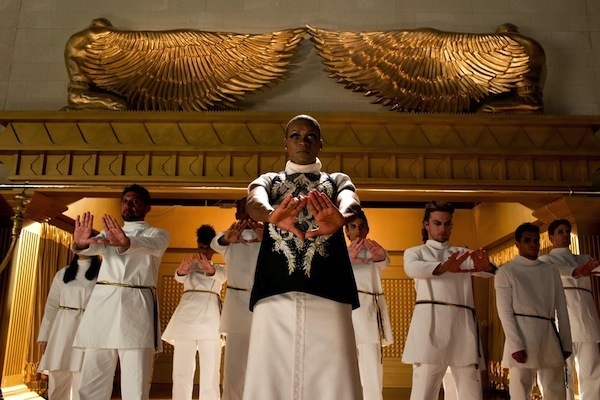 Demonstrating Yael Bartana’s recurrent interest in the concepts of return and belief, the exquisite ritual staged in Inferno, 2013, engages with the strange confluence of Evangelism and neo-Pentecostalism in present day Brazil and their connections to the Holy Land and Judaic traditions. Commissioned by the Pérez Art Museum Miami, the Israeli artist’s luscious and provocative eighteen-minute film addresses the current construction of the third Temple of Solomon by the Universal Church of the Kingdom of God in São Paulo. Based as much on fact as fiction, Bartana’s project emerged from a research residency initiated by curators Eyal Danon and Benjamin Seroussi devoted to considering the rise of “new religious movements.” Built to biblical specifications, this new temple includes material directly from Israel and intends to replicate the first temple in Jerusalem, the violent destruction of which signaled the first diaspora of the Jewish people in the sixth century BCE. Displacement is of course another theme Bartana cyclically revisits. The characters in Inferno are anachronistically dressed in white linen tunics and fruit headdresses, conflating Biblical times with hippie bohemia and socialist uniforms. By the time the fire and brimstone begin, the sheer beauty of Bartana’s tableau has already mesmerized the viewer. At once ancient and futuristic, using an evocative combination of prophesy and imagination, Bartana’s “historical pre-enactment” echoes the epics of blockbuster cinema with a twist of tropical kitsch. The bizarre transposition of the Wailing Wall to Latin America as a site for pilgrims to worship as well as for tourists to sip from menorah-emblazoned coconuts exemplifies the insufficiency of concepts such as hybridity to address the complex intermixing of influences in either contemporary culture or religion.